For all the high-jinx jolliness of this time of year, late December can be tension territory. Fun friends or family get-togethers can get all together less fun when cousin comments on something she shouldn’t, or brother and sister start bickering about a thing over the brandy butter and mince pies. Putting lots of people into a space and filling them up on food and booze can sometimes add fuel to the fire of seasonal stress, and tips for taking the testiness down some notches are appearing everywhere right about now. The salient point to stick to I suppose is that a picture-perfect holiday gathering is a cheesy movie myth, and nothing more. 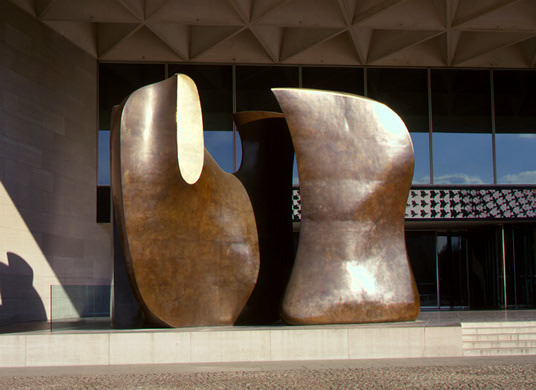 And anyway, it seems that sometimes a little knife-edge tension can actually come out looking rather lovely: Knife Edge Mirror Two Piece (1976-1978) by Sir Henry Moore stands serene and shimmering at the entrance of the NGA East, and what an enveloping and evolving work it is. 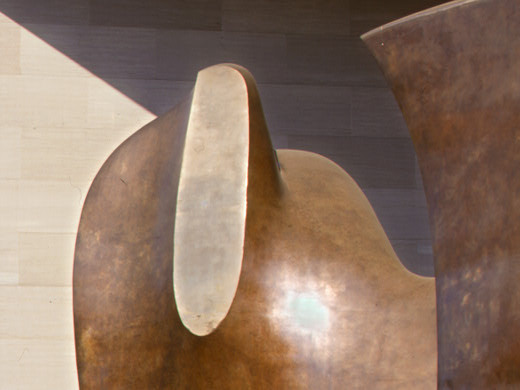 Born into a mining family as the seventh of eight children, Moore (1898 – 1986) would become the most famous British sculptor of the 20th century. The two subjects that stick out most obviously in his oeuvre are the mother and child (which he treated without sentimentality) and the female figure (often looking fluid as a landscape). Knife Edge Mirror Two Piece perfectly platforms so much of what Moore was about. 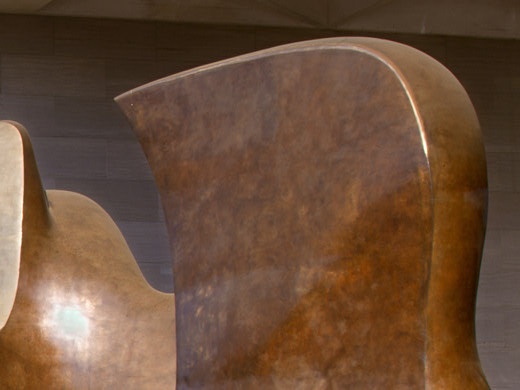 For a start there’s truth in his use of materials, so that bronze still looks like bronze (Moore said “stone should not be falsified to look like soft flesh… it should keep its hard tense stoniness). He’d started his career carving stone and wood but after the war began working in bronze, which allowed him to go bigger and better, as here. Cast in several pieces, this piece is run-through with the very feel and flow of the material. 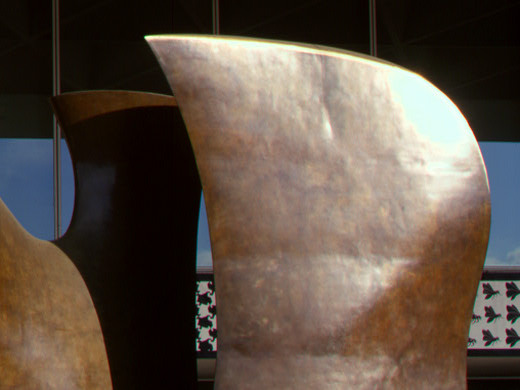 What I love about Moore is his utter rejection of classical or Renaissance ideals of beauty: instead he tapped into older times, taking ancient and primitive sculpture as his source and inspiration. 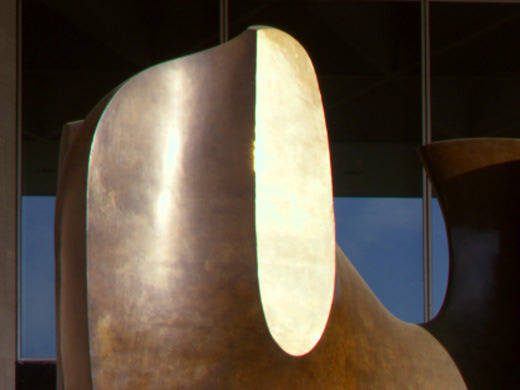 This work here has an undulating energy that seems to shimmy up and through the forms. In fact I’d say the formula here is to be entirely form-driven, with Moore himself seeming to push us to an acceptance of shape and space as stand-alone entities. “The sensitive observer of sculpture must also learn to feel shape as shape, not as a description or reminiscence” he said. So there it is, an assemblage of curved shapes showing soft sides and flat facets that entrance us at that entrance with their simple grace. Soothing, for sure. What seasonal stress?